My attention was recently directed back to Die Säulen von Venedig after reading this post by Susan Rozmiarek. Based on initial pre-Essen reports, I had this game on my watch list, but removed it after reading the rules. It hasn't been well received thus far by its non-English owners judging from its #1110 spot on BGG, but the session reports I have read are fairly positive. So I asked myself, "What makes me interested in a game after reading a blurb about it, but lose interest after investigating further?" Certainly the bits can draw my attention--and they did to some degree here--but that is not the whole story. I think what attracts me and many others to a given game is What You Are Doing (WYAD). The images and the blurbs convey this. The theme and overview support this. In the case of Die Säulen von Venedig, you are building the city. This is such a common thing in games. People love to build things: cities, railroads, castles, zoos, civilizations, empires, kingdoms, coral reefs, electric grids, plantations, you name it! Building things usually involves placing various tiles and bits on some sort of square/hex grid or onto a network of connections. No doubt you recognize most--if not all--of the above themes. But why are you building? In Carcassonne, players build one big map together. The goal is not to build the biggest map. In Euphrates & Tigris, players build up large kingdoms, yet the goal is not specifically to do so. In fact, you could win by destroying a kingdom. Likewise, in Die Säulen von Venedig, players all contribute to building Venice. So what's going on here? Of course, what makes all of the various building games unique is the mechanics used to build and the ways in which scoring occurs. This is what I am calling What You Are Thinking (WYAT). You may have no interest in building at all. You may be trying to score points, position yourself to score in the future, or block the opponents' ability to do the same. 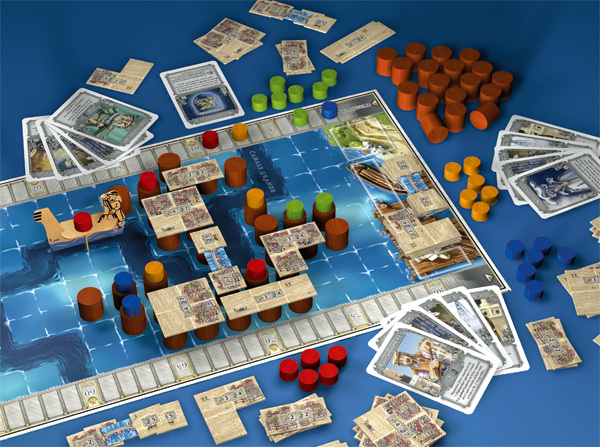 In Die Säulen von Venedig, you can score points by building, but you can also score when players use your pillars, when players build along the canal when you control the Gondola, or by meeting certain conditions on some cards. In addition, each time you use a card you lose it, passing it to the player on your left. So there are times when you might not do something beneficial to you because you don't want to help another player even more. In the end, you may not be thinking about building at all. If you approach a game based on WYAD and think, "Hey! This looks cool. You build up a city on pillars," then you might be in for disappointment when you realize that part of the game relies on simultaneous action selection, or that the cards/roles are random. If you like building games no matter how they work, then WYAD might work fine for you. If you've read the rules (or any sufficiently detailed review), then you are able to see both WYAD and WYAT, and can make a solid judgment. I think it's very likely that many people buy games based on WYAD and leave them gathering dust based on WYAT. So What's the Forecast in Venice? It's back on my watch list. Shrug. Sometimes I want something lighter and more random. I don't exactly know where to fit this game. It's a little heavy for my non-gaming friends, and a little light for the game group. It might work for either in the right circumstances. Is it going to be printed in English?